Mr Funk could you please give us some more detailed information about the project EngineerING Card? When was the project launched and who was the initiator of the project? 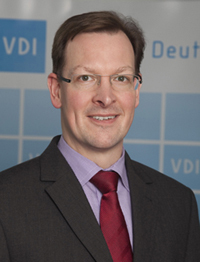 VDI as German FEANI member launched the project in 2010. FEANI agreed about the concept at its General Assembly in October 2010 in Sofia. At the beginning only two countries participated in the project and started with issuing engineerING card: The Netherlands and Germany. Until today 11 countries joined the project, and some more are looking forward to participate. Was the main motif for launching this project to increase the mobility of engineers and simplify the procedure for recognition of their qualifications? Yes, increasing mobility is the main goal of the card. For this purpose, the recognition procedures have to be simplified. But this is not enough: What we need is also more transparency for employers. At the moment it is often not possible for them to get an appreciation of the qualification of an applicant, especially if this qualification has been awarded in a foreign country. The engineerING card helps to asses this qualification. Last not least the engineerING card helps to get a European wide accepted definition of the engineering status. This can be achieved because the engineering card is based on existing European standards like the EUR-ACE-Framework for learning outcomes of engineering courses. What does EngineerING Card actually represent? Does this card provide complete insight into education and professional experience of the card holder and what kind of a record is kept regarding the card holders? The card gives a complete overview about the qualification of an applicant. This includes academic degree(s), professional experience and continuous professional development. The minimum requirement for awarding the card is an academic degree in engineering with at least 180 ECTS. The engineering card provides not only a complete information about the qualification of an applicant, this information is also validated by experts and it is classified referring to international standards. This is the big advantage of the card. How is the issuance of the EngineerING Card regulated and what kind of monitoring is implemented for the entire process? The card is issued by the FEANI Partners in the participating countries. Applicants are asked to apply in the country where they got the qualification. If this was done in more than one country they can choose where to apply. The FEANI partner has to establish a so called register committee with experts from companies, universities and engineering associations. This register committee is responsible for the issuing of the engineering card at national level. The committee acts according to the FEANI rules as described in a managing handbook. At European Level the so called European Monitoring Committee of FEANI is responsible for the monitoring of the whole system. This is done by constant reporting as well as audits in all countries. In how many countries, the engineering organizations of which are the members of the FEANI, is the project implementation initiated? At the moment 11 countries are involved in the project: Next to Serbia these are the Czech Republic, Croatia, Germany, Ireland, Luxemburg, Macedonia, The Netherlands, Poland, Portugal and Slovenia. What does the EngineerING Card possession signify for the members of engineering associations in such countries? Has the card holder been provided with an easier access to labor market and employment in major companies in Europe and worldwide? 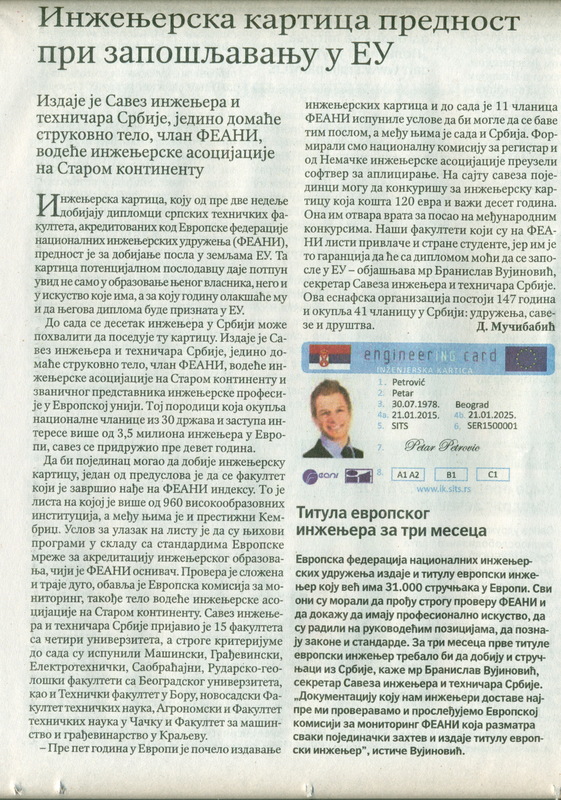 More specifically, can the fact that an engineer from Serbia is the card holder be considered as an advantage when seeking employment in EU countries? This will definitely be the case. The engineerING card does not replace a normal application, but it complement it in a very important point due to the fact the information on the card is validated and classified. This helps for recognition procedures as well as for applications in industry. In fact the engineerING card is a real mobility tool. The latest modifications to the EU Directive 2005/36/EC have envisaged the option of introducing professional cards for the representatives of various professions, at the explicit request of the profession members. The representatives of the FEANI participated in work of Steering Committee on the Professional Card. Can you tell us to what extent the project is in line with the Directive modifications? The principles of the European Professional Card as described in the new EU-Directive are fully in line with the engineerING card concept. This is a big success for FEANI. Nevertheless, at the moment there are some differences in the procedures of issuing and handling the card. Unfortunately, the European Commission is only focusing on recognition procedures, completely ignoring the necessary transparency for employers. In consequence the engineers will not request for the European Professional card at this moment. Instead we will move on with the engineerING card and we think that we have good arguments to convince the European Commission that our concept is the better one in the long term. How do you expect the project to be developed and implemented in the forthcoming period? Some more countries will join the project in 2014 and 2015. The Engineering Schools of France are very much interested and they would like to start soon. Also Spain and Slovakia is preparing the implementation of the card. The Countries who still have implemented the card will invest in the marketing. This is very important because due to the fact that the engineerING card is a new product it is not well known at the moment. But this will change in a little while. For this purpose the engineering associations are working together with universities as well as companies. All in all: The project will grow significantly in the next two years.